Neil deGrasse Tyson is coming back to TV soon after completion of an investigation into alleged sexual misconduct. Fox and National Geographic have wrapped up an investigation into alleged sexual misconduct by the astrophysicist and science communicator, clearing him to return to TV, The Hollywood Reporter reported Friday (March 15). National Geographic will begin airing Tyson's talk show, "StarTalk," which had been on hiatus since November, next month. And both Fox and National Geographic plan to run the Tyson-hosted series "Cosmos: Possible Worlds" at some unspecified point in the future, according to The Hollywood Reporter. "The investigation is complete, and we are moving forward with both 'StarTalk' and 'Cosmos,'" Fox and National Geographic said Friday in a joint statement published by The Hollywood Reporter. 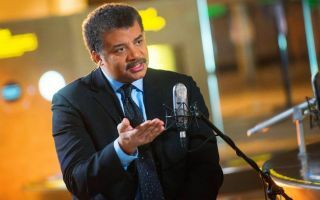 "'StarTalk' will return to the air with the remaining 13 episodes in April on National Geographic, and both Fox and National Geographic are committed to finding an air date for 'Cosmos.' There will be no further comment." Three women have publicly accused Tyson of inappropriate conduct. Astronomer Katelyn Ayers said Tyson groped her at a 2009 conference, and Tyson's former assistant Ashley Watson said she quit after the famed astrophysicist made inappropriate sexual advances. The two women detailed these claims in November 2018, in an article on Patheos. The third woman, Tchiya Amet, said that Tyson raped her in 1984, while the two were graduate students at the University of Texas at Austin. Tyson has denied the allegations and said he welcomes an investigation.